6th grade math worksheets, games, problems, and more! 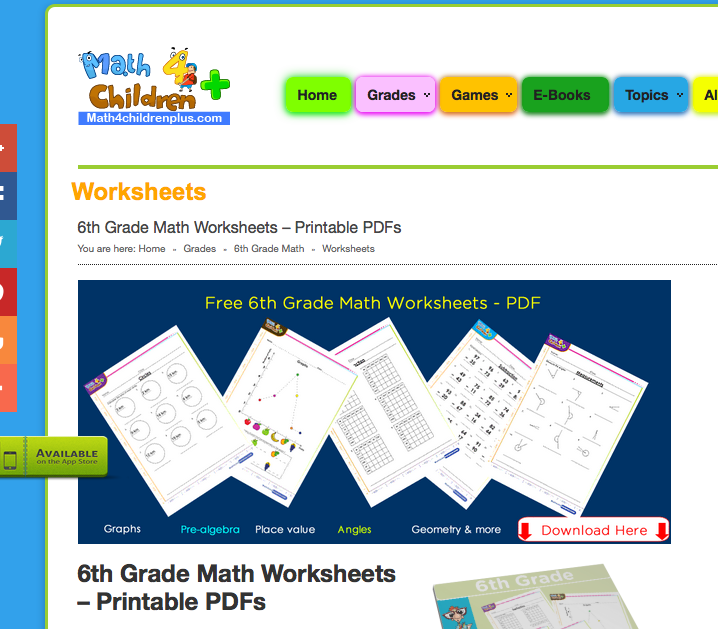 6th Grade Math Curriculum, Worksheets, Problems, Lessons, Games and More! You are probably reading this right now stressed, frustrated, exhausted, etc. because your 6th grade student is having difficulty with the 4 letter word “math”. I feel you–and as someone who tutored for 7 years, I absolutely understand where you are right now. But there’s good news! You don’t have to feel this way! As the CEO of the leading in-person and online tutoring company in the nation, I feel the obligation and duty to help all 6th grade students master their mathematical skills, regardless of if they use our services or not. Therefore, my team and I have spent dozens of hours of research to compile a regularly updated post on everything you need to know about 6th grade math from the most credible resources currently available on the web in an practical and engaging format. We break it down into 5 steps. The same 5 steps our tutors use to ensure academic success! Navigate through this content by clicking on any of the links below or a link on page navigation sidebar to the right. It is our mission to spark bright futures. We hope the information we provide sparks a brighter future for your student. If you like this resource, please help support our mission by linking out to it on your website or sharing it via social media. It would mean the world to us! (4) developing understanding of statistical thinking. The common core breaks 6th grade math down into 5 sections as listed below. Click on the links to view more information on the specific standard. See 6th grade math common standards in detail by clicking here. Well, there you have it! Everything you need to know to efficiently identify all common core 6th grade math standards and curriculum. 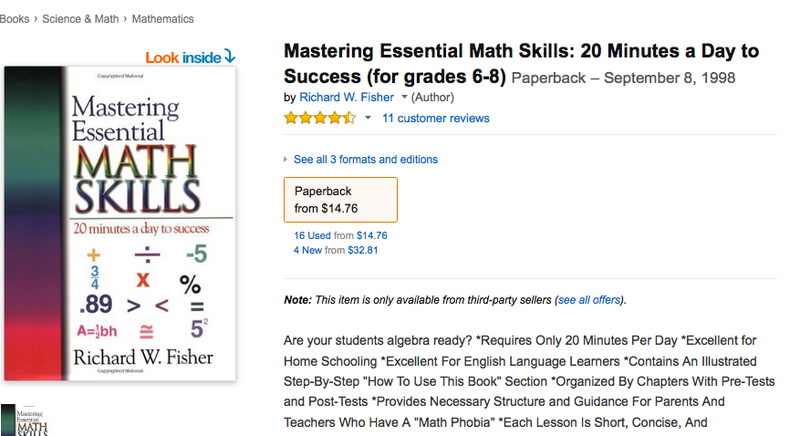 Now it is time to teach yourself everything you need to know about 6th grade math. Now that you know all the 6th grade math curriculum and what is expected by common core, let’s show you the most credible, trustworthy, and best resources across the web to help teach you the curriculum and standards. 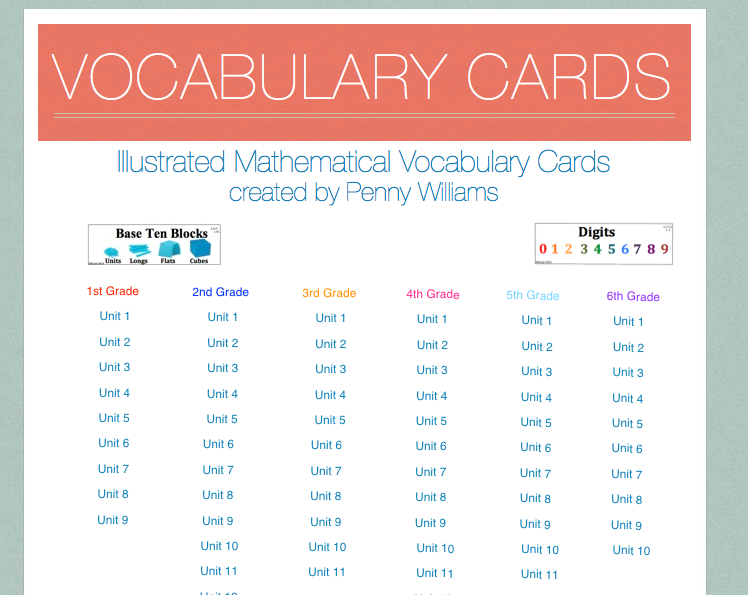 10 units of illustrated 6th grade math vocabulary? What more could you ask for? Thank Penny Williams for these useful study tools. Print them out or use them to study digitally! Some great notes about these cards: the illustrations will help you remember the words better, because you’ll have more you can associate them with. Unfortunately, they’re not like traditional flash cards, meaning the word and definition are on the same side. These cards are more of a learning tool, and less of a self-quizzing tool. For interactive online flashcards, Cram.com is a great place to look. This particular set features 81 6th grade math vocabulary terms. Click them to see the definition and test your knowledge. You can also hear the pronunciation of each term! Unlike Penny Williams’ cards, you can test yourself with these. You can study them under the “flashcards” tab, or get a more structured test under the “memorize” tab, where you can select whether or not you know the flashcard’s definition. That way, you end up studying the terms you don’t know, so you can spend your time wisely! At first, AAAMath looks like a website to write off. It seems spammy and surrounded by ads…until you explore a little more and realize that wait, those aren’t ads, those are other lessons! Under their 6th grade tab, you can find 35 different sections, each with anywhere from two to ten lessons. Granted, the lessons are short, but they’re to the point, and scrolling down provides you with a chance to practice the concept before moving on to the next one. They even provide a map to their curriculum, so you know exactly which of their lessons map to Common Core standards, and how. 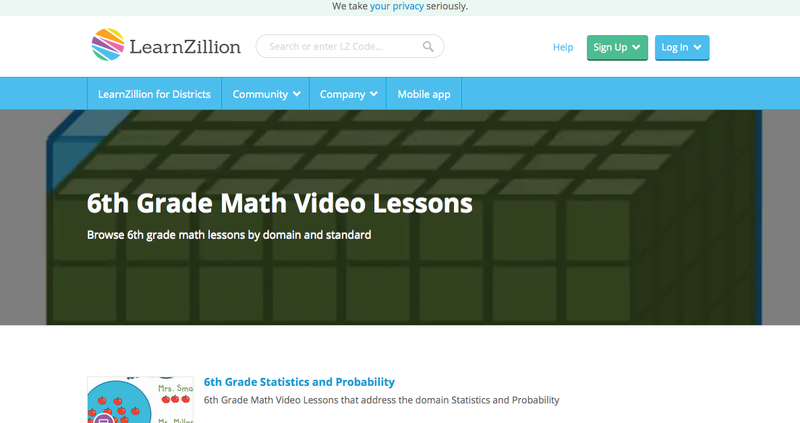 In other words, if you’re looking for a free place to get some extra practice on 6th grade math concepts, this is a great website. If you’re a 6th grade math teacher looking for some help on your lesson plans, this is the place to be. Community members create and upload their lesson plans here for your use. Each 6th grade math lesson is a little different, but they all usually include documents for classwork, homework, and various worksheets and answer keys. You can preview the documents in the Better Lesson window, or you can download and print them out! Another helpful resource is the Master Teacher Lessons tab, where the best teachers from around the globe have uploaded video lessons that clarify any 6th grade math points your students might still be a little confused about. To access the full website, you do need to sign up for an account, but the accounts appear to be free–no subscription necessary! This platform isn’t free–it’s $19.95 per student, per month. But if you’re a teacher looking for an online platform that your students can use to play games and get extra math instruction, this is what you’ve been looking for! 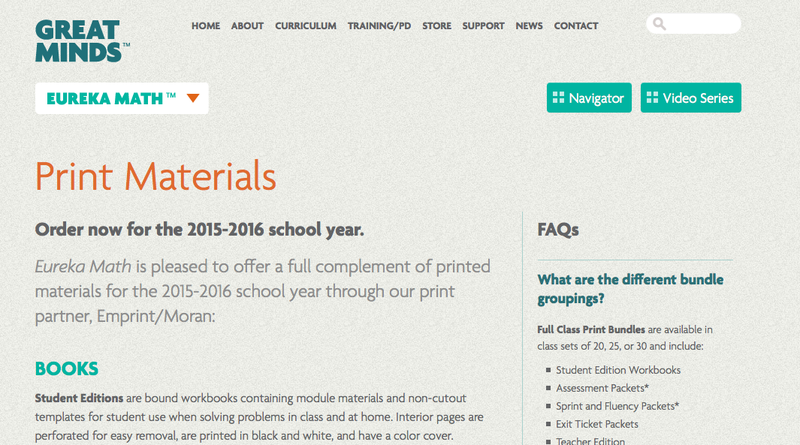 You can browse their lesson plans, split up into eleven chapters just for 6th grade. You can also look at their demos, if you want to try before you buy. Another cool feature is that the 6th grade subscription also includes all 5th and 7th grade lessons, so your students can work at their own pace! If they’re shaky on a concept, they can go back and review it, or if they finish quickly, they can move ahead into tougher material. I know you’ve heard of YouTube, but have you heard of TeacherTube? 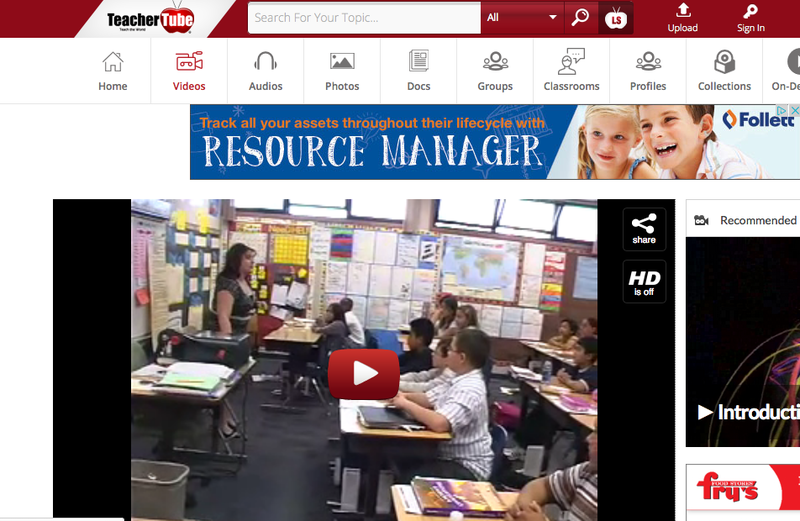 This is exactly what it sounds like–a website where teachers can upload videos of their classroom, or other teaching methods, and you can watch them (or show them to your class) for free! If you type “6th grade math” into the search bar, you’ll find tons of results. And many of the videos are titled with specific Common Core standards, which helps you further break down what you’re looking for. Plus, TeacherTube goes further than YouTube. Instead of being limited to videos, you can search documents, photos, audios, or anything else you need for your lesson. 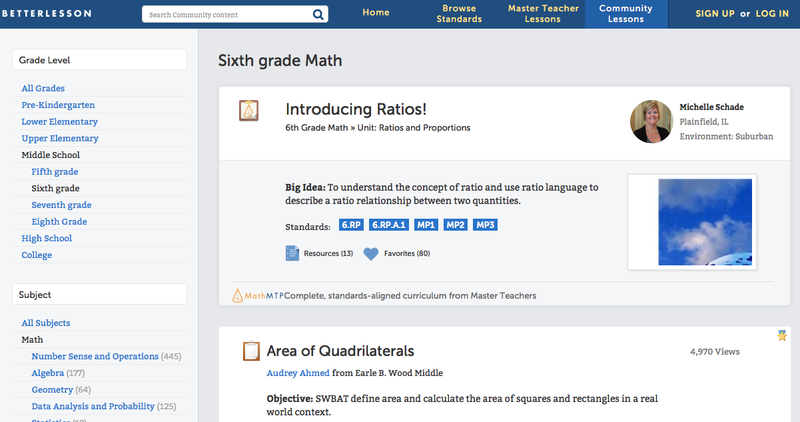 You can even search “Collections” (which are like playlists) and narrow your search to “math” to find a curated group of 6th grade math lessons that suit your tastes! When you’re looking for free 6th grade math videos online, you’re bound to find a ton of low-quality ones. But Learn Zillion bucks that trend. The 6th grade math videos here are broken up into the five main Common Core standards; statistics and probability; expressions and equations; the number system; geometry; and ratios and proportional relationships. If you click on any of the standards, you’re taken to a page with roughly five more videos that relate to that specific topic. To access the videos, you need to sign up for a free account, but that’s all. No money needs to change hands to enjoy these beautifully-designed, high-quality videos! 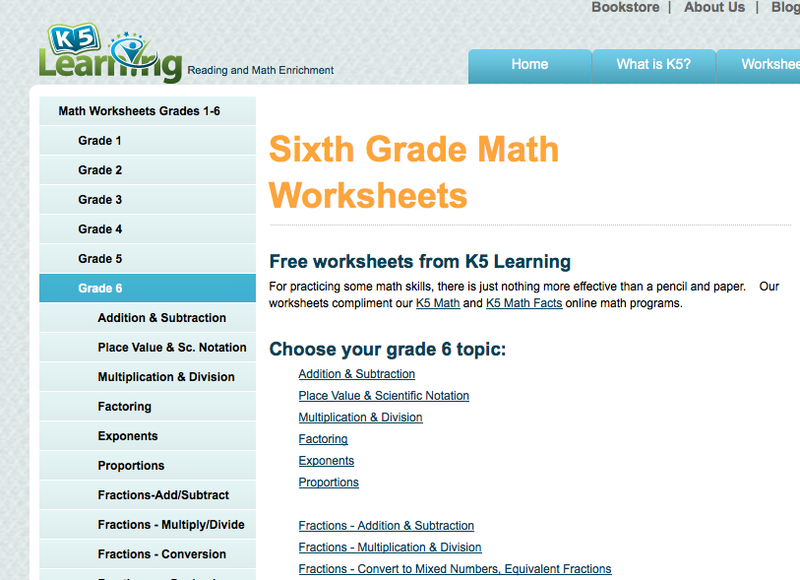 IXL Learning offers an entire page filled with 6th grade math standards. Students can click on any topic that they want to practice, and they’ll be instantly taken to a practice problem. If they get it correct, there’s no explanation following, and afterwards, the website takes you to a new question. However, if the answer is incorrect, a full explanation pops up with illustrations, and you have to click “Got It” at the top or bottom of the explanation to continue practicing. The sidebar also tracks how long you’ve been working, how many questions you’ve answered, and how many you’ve gotten correct. 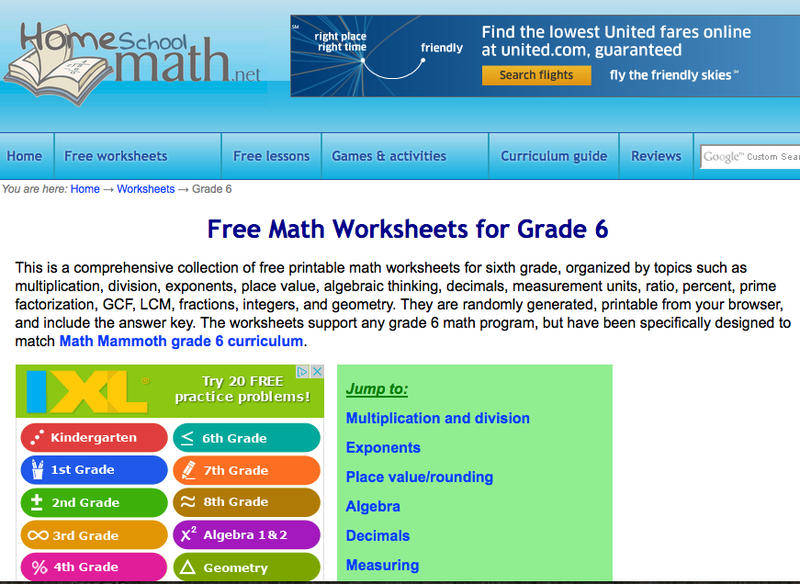 If you want to go back and practice other standards, just click on the words “Sixth grade” underneath “MATH,” and choose your next topic. Looking for word problems for your 6th graders? 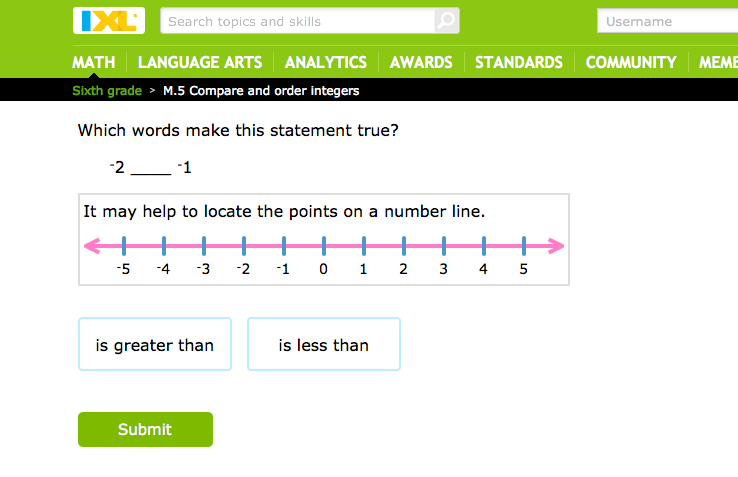 This website offers 26 word problems, and they include answers, as well as detailed explanations. If you dig a little further, you’ll also find example problems for fractions and mixed numbers, as well as percent questions. Unfortunately, there appears to be no easy print button for any of the example problems–but copying and pasting them into a word document should do the trick. 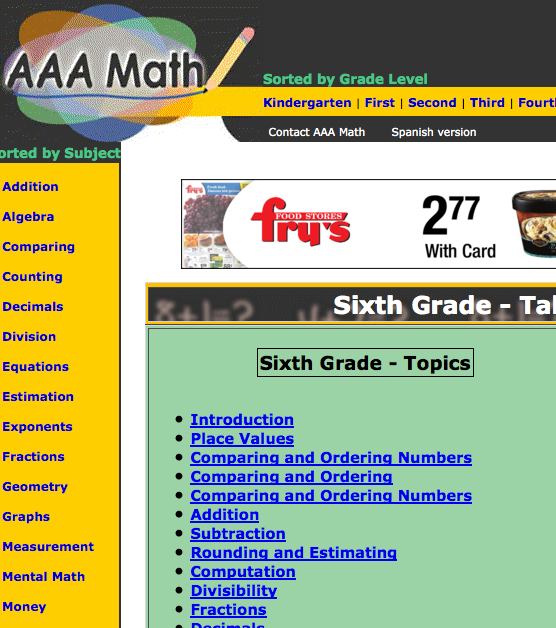 I’ve talked about this website on our 7th grade math article, and for good reason. These worksheets are easy to download and print, and they offer SO MANY worksheets for your 6th grade math purposes. By SO MANY, I mean that they offer easily over 200. Each worksheet also comes with an answer key on a separate page, so you can feel confident whether you’re a parent or a teacher (or a student, testing yourself)! This website also offers online calculators for divisibility tests, and adding/substracting/multiplying/dividing integers. K-5 learning is a misnomer, because, clearly, they offer worksheets for 6th graders. And they also offer over 200 worksheets, broken up by common core standard and then smaller topics. But here’s the kicker. Each worksheet can be refreshed to create a new worksheet. So, not only do you have 200 blueprints, but you have infinite versions of each of these 200 worksheets. This is enough to practice math until pigs fly! Also, bonus–each worksheet is easily printable, can be downloaded as a PDF, and comes with an answer key. Are infinite worksheets not enough? Here are MORE infinite worksheets! 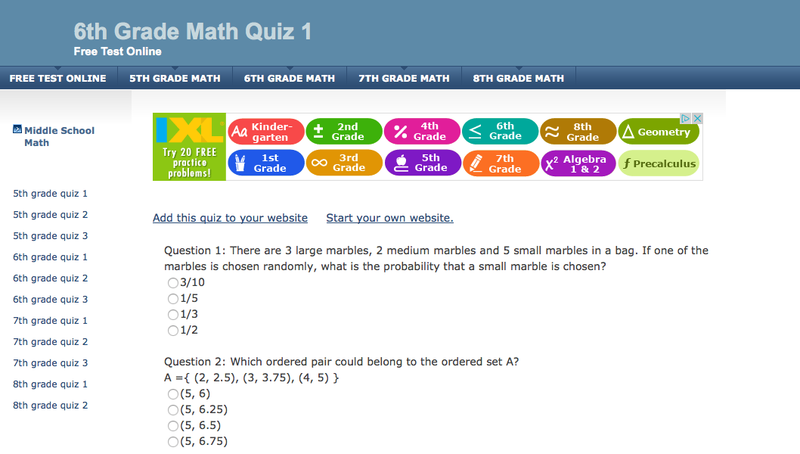 These 6th grade math worksheets also randomly generate each time you click on one of the 99 6th-grade-math specific links. It is important to note, however, that these worksheets don’t include problem-solving. Instead, they focus on smaller skills, like order of operations, long division, area of polygons, and so forth. If you’re looking for problem-solving practice, you will need to look elsewhere. These pages are bound–they don’t detach. There is a full answer key in the back of every workbook. Each concept gets a single page of practice. But I think the operative points are that it takes 20 minutes (at most) of practice per day, and moves forward at a good clip. Also, the full answer key guarantees that a 6th grade student practicing on their own could double-check their work, instead of only knowing the correct answers to the odd problems. All anyone really wants in a math workbook is that it’s helpful. And scrolling through the Amazon reviews of McGraw-Hill’s 6th grade math workbook, “helpful” is the operative word. Many also cite this book as clear and easy-to-understand. Things to watch out for: apparently, this book is not exempt from human error. There are a few mistakes in the answer key. But like typos in classic novels, this is nearly unavoidable. And imagine how excited your student will be if they learn their math so well that they can find a mistake in the workbook! 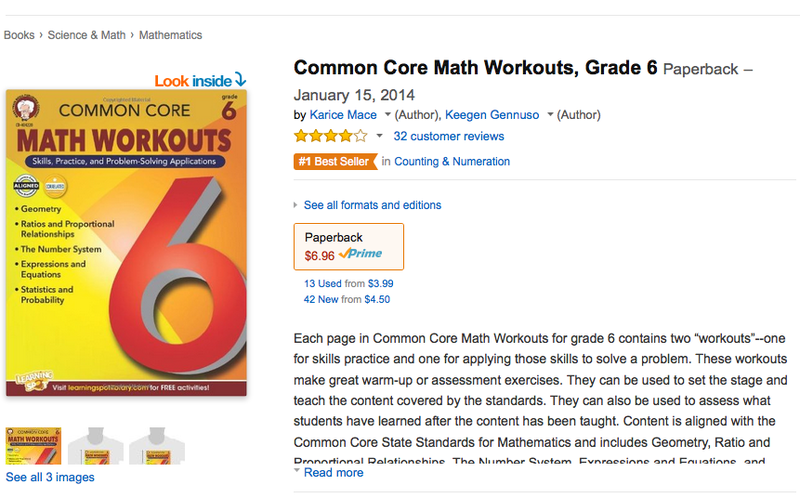 The main plus to this workbook is that it’s aligned with 6th grade Common Core standards. Also, it’s important to note that this book is rated as very difficult. Many of the reviews say that their kids struggled for a while, or needed help. 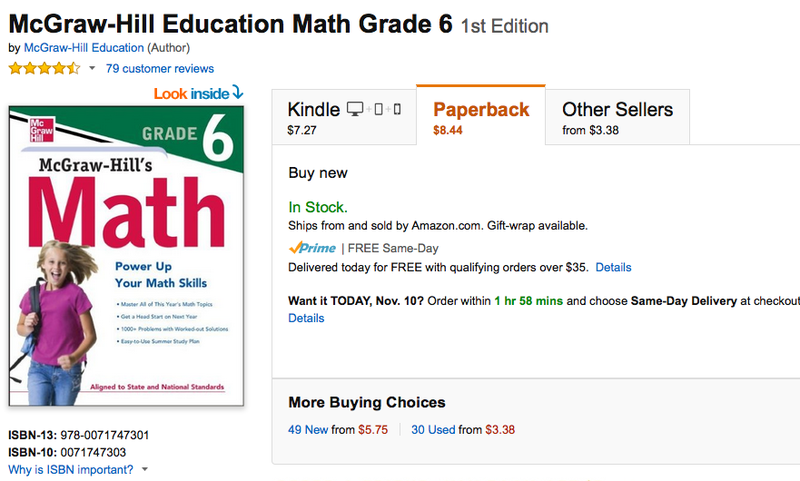 If a difficult 6th grade math book is what you’re looking for, look no further! There are a whole lot of textbooks out there claiming to be aligned with Common Core standards. But EdReport did a detailed investigation of over 80 textbooks–and only a handful were actually up to snuff. Here are the two 6th grade math textbooks you can count on. Eureka Math passes with flying colors for every single grade level. 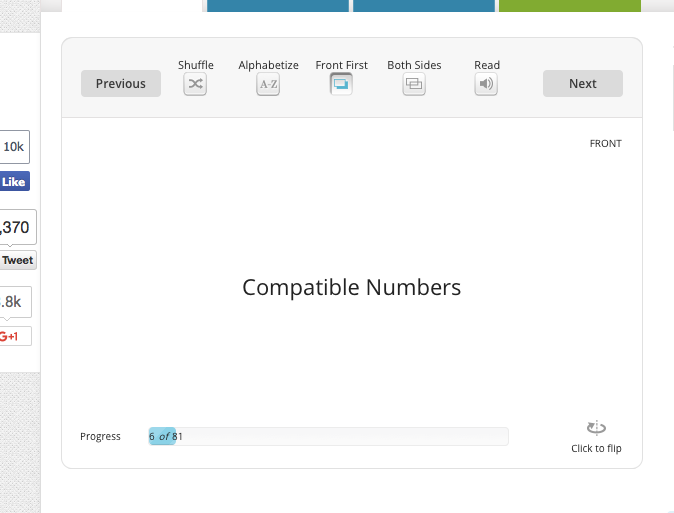 As far as Common Core standards go, Eureka Math is fully aligned, and also passes EdReport’s first and second gateways. It’s only rated as “partially passing” the usability gateway, but other than that, this is absolutely the 6th grade math textbook to rely on. 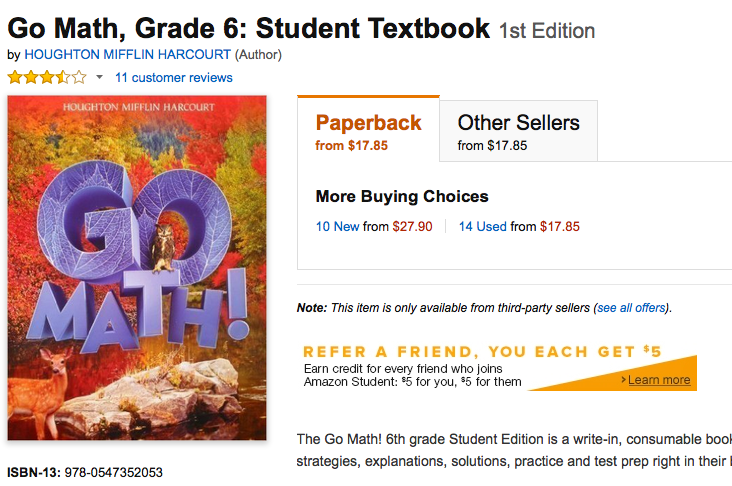 The only other 6th grade math textbook worth mentioning as far as Common Core standards go is “Go Math, Grade 6” by Houghton Mifflin Harcourt. This textbook is rated as “fully passing” EdReport’s first gateway, and “partially passing” the following two. Another interesting part of this textbook (yes, TEXTBOOK–not workbook) is that every page is perforated, and can be torn out. Students can also write directly in the textbook–notes, test prep, or any other learning tips. Of course, this could be seen as a drawback, but regardless, it is a feature of this textbook. Free Test Online offers three different 6th grade tests, each with ten questions. After answering all ten questions, you can click “submit,” which brings up a table. The table shows how many questions you answered correctly and incorrectly, and gives you all the correct answers. However, Free Test Online provides no explanations for why you got your question wrong. Overall, though, the questions are a good review, and can be used as a good practice test for yourself or a class. If the three practice tests offered above aren’t enough, no worries! 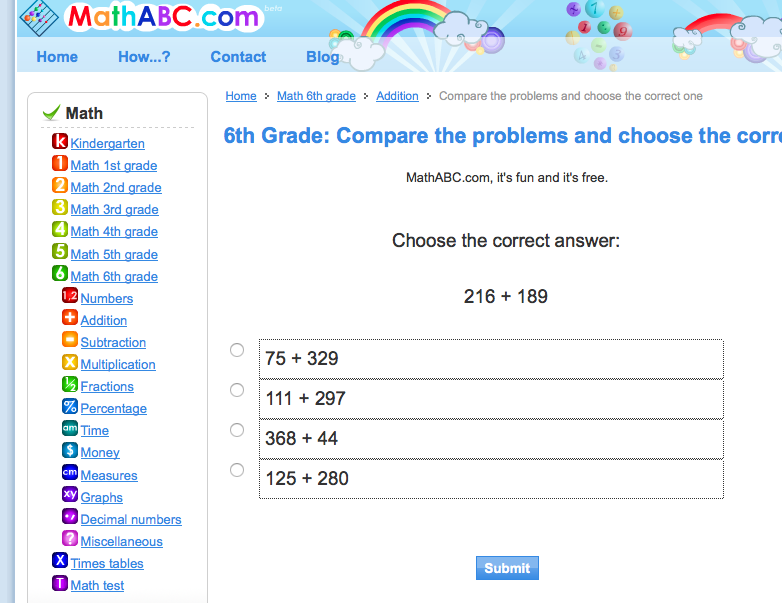 ABC Math provides over 200 practice tests, each on a different subject. You can browse by larger subjects–like “percentage”, and then look through the tests available. Each test has a rating between one and five stars, and gives you the opportunity to check your answer after each question. Also, you can access these tests for zero dollars! Just get online and start practicing your 6th grade math! 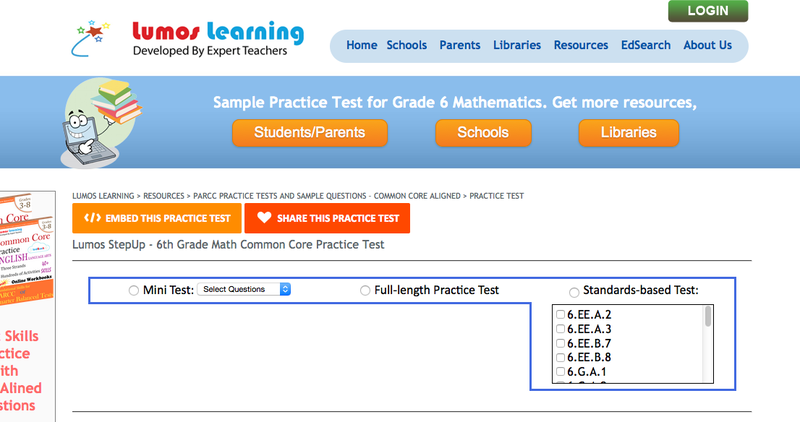 If you’re looking for basic 6th grade math practice, Math-Tests.com is the place to go! It offers different free online practice tests on the subjects of factors, multiples, percents, decimals, and more. With practice tests, it’s fair to say that there’s a scale. Some are more on the “practice” side, and give paragraphs of explanation after you get a question wrong. But Math-Tests.com is definitely on the “test” side. This means that the tests have a time limit, and if you get a question wrong, there are no helpful paragraphs explaining why. So, if you’re looking to see how you do under pressure, try out a test from Math-Tests.com. If you’re looking for a more low-key, customizable experience, check out the description for Lumos Learning (below). I talk about Lumos Learning on practically all of these blog posts, and that’s because it’s fantastic quality. Here, you can get a full practice test experience. If you’re looking for a customizable, Common Core aligned, 6th grade math practice test with instant feedback, Lumos Learning is the place for you. Practice for free, and choose the length of your test. You can even customize the standards you practice! Note: If you choose one standard/topic to practice, you’ll end up with a practice test that’s only two questions long. Because of that, either choose an ENTIRE standard (for example, all the 7.EE’s), or mix it up. Just make sure you check at least five boxes to get a practice test of reasonable length. Or, if you care less about the particular topics, and more about the test length, Lumos Learning has a setting for that! You can choose “Full Length Practice Test,” or you can choose “Mini Test,” which gives you the option to pick between 3 and 43 questions. This particular 6th grade math game takes you on a journey. Instead of just answering math questions against a fun background, or spinning a wheel and answering questions, this is an actual GAME. It is just a demo–you’ll need to pay if you want the full game–but the demo is highly playable and definitely worth a shot. It’s also a little more abstract than most educational games. It requires some clicking around and experimentation to figure out exactly what the game wants you to do. Wait, WHAT? Math games that are ACTUALLY, INDISPUTABLY FUN? I was amazed, too. Math Playground ups the ante 500% when it comes to math games. These are fantastically designed and incorporate storylines, participation, and also learning. Here are my top two picks. 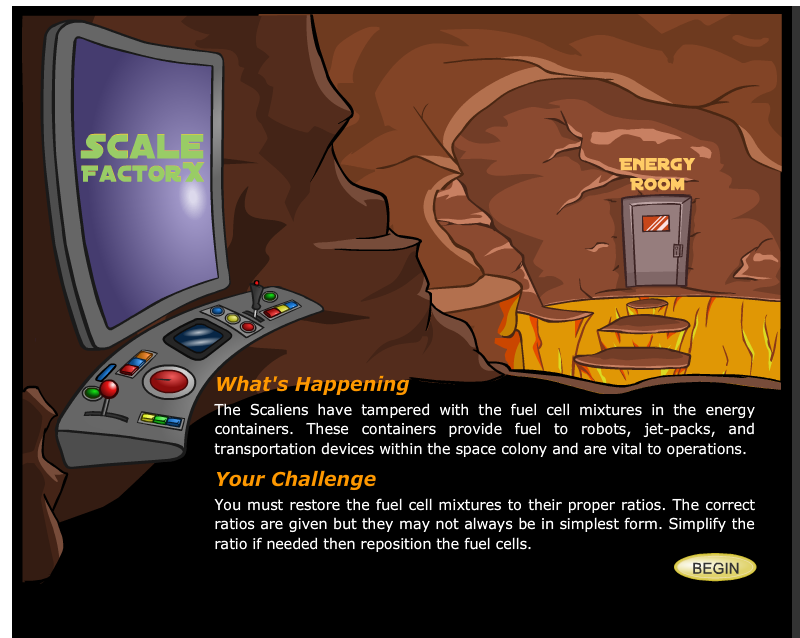 Scale Factor X2 is a game. You’ve got a problem and a mission, and you move from room to room in a visually dynamic way. Plus, your challenges are math-related, so your learning opportunities are clear. Otter Rush isn’t as dynamic as Scale Factor X2, but it takes math questions and makes them legitimately interesting. You become an otter and join an “otter race” with other players from around the globe. The catch? Your speed depends on how fast you answer math questions. The music, the visuals, and the idea of competing with other students all provide a background that makes these questions weirdly exciting. This is one game you otter play! Maybe I’m just including this one because I’m nostalgic. But nah, I don’t think so. This game is seriously fantastic, and, bonus–the math is cleverly hidden away. 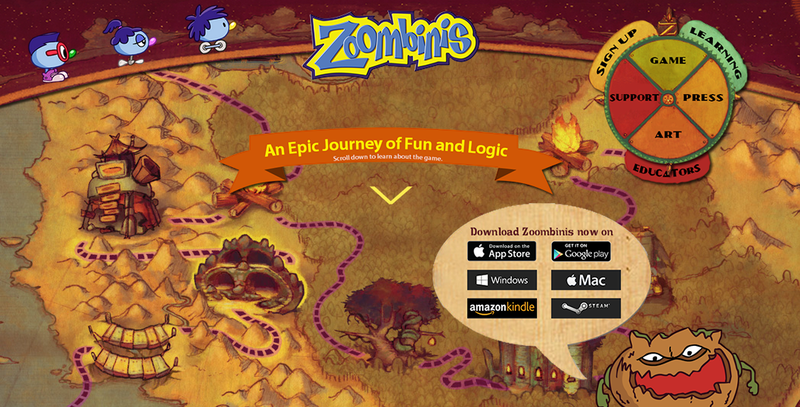 This entire game is about teaching logical thinking, and teaching how to process information like a computer–and it teaches it through clever and legitimately fun challenges. The game is also a true journey, in which you follow your heroes from their homeland to a new place of prosperity. 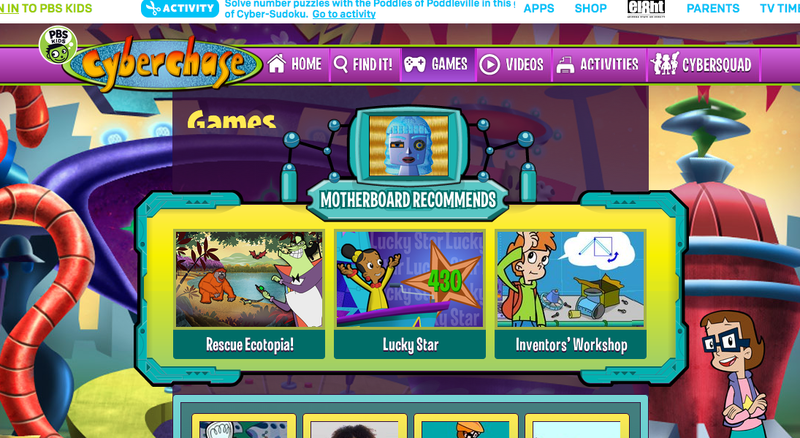 If you’re looking for shorter, standalone, fun math games that also integrate math principles, these Cyberchase games are fantastic. They cover tons of 6th grade math principles, and they’re also entertaining and well-crafted. While all math skills and concepts learned in 6th grade are important, this section focuses on a few key math concepts that MUST be reviewed, practiced, and understood in order for students to successfully build on their math knowledge and increase their mental math speed going forward. Many times if a student struggles in high school it is because he/she still does not have these essential concepts down from middle school or even earlier! Some of these concepts may not have been taught in 6th grade, but they should remain the main focus of review. 6th graders and up should known how to add, subtract, multiply, and divide positive and negative numbers. Negative numbers, in particular can be tough for kids to ‘wrap their heads’ around. Negative numbers introduction: Mysterious negative numbers! What ARE they? They are numbers less than zero. If you understand the nature of below zero temperatures, you can understand negative numbers. We’ll help. Spends a lot of time thinking about problems that should be mastered. Loves addition but gets stuck when a number has a negative sign. Connect to real life like digging a hole, temperature, diving under water, and owing money. …is the fun way to remember the steps we have to follow to solve math problems: Parentheses, Exponents, Multiplication & Division, Addition & Subtraction. If one does not follow the order of operations, he or she will come up with an answer, but it will be wrong! Answer to expression above = 28. Introduction to order of operations: This example clarifies the purpose of order of operations: to have ONE way to interpret a mathematical statement. Does not know what the purpose of PEMDAS is. Gets different answers after solving same problem multiple times. Expresses stress or anger when working basic algebra problems. Review & test your child’s speed & accuracy with order of operations. Middle schoolers see algebraic problems getting more complex. Students need to be able to solve – without error – equations and expressions that requires multiple steps. Introduction to solving an equation with variables on both sides: Sal solves the equation 2x + 3 = 5x – 2. Takes a lot of steps that do not get them closer to solving. Reports “not having enough time” on math homework, quizzes, or tests. Linear equations are present throughout algebra and students in middle school need to master this skill to be ready for more complexity in high school. Lines can show up in a few different forms, but the most popular one is “slope-intercept form” or y=mx + b. In y=mx + b, x and y are the variables that represent points on the graph, m is the slope (rise over run), and b is the y-intercept (because if you plug in 0 for x, you are left with b or the point (0, b). Make sure you have these concepts mastered by clicking here! 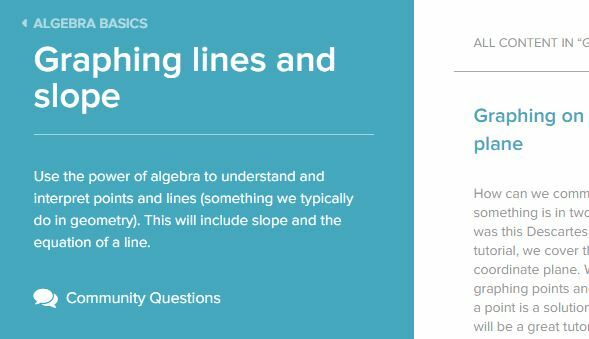 Here you will learn everything you need to know about the graphing lines essential 6th grade math concept. Expresses stress or anger when graphing linear equations. Attempts to have calculator compute graph line for him/her. Make practicing a game: create a giant ‘grid’ on the floor and practice graphing points with your whole body standing where the point should be! Remember to use our 5 step proven learning process when going over 6th grade math topics and concepts. Review the essential 6th grade math concepts needed to be successful in upcoming years. Want more! 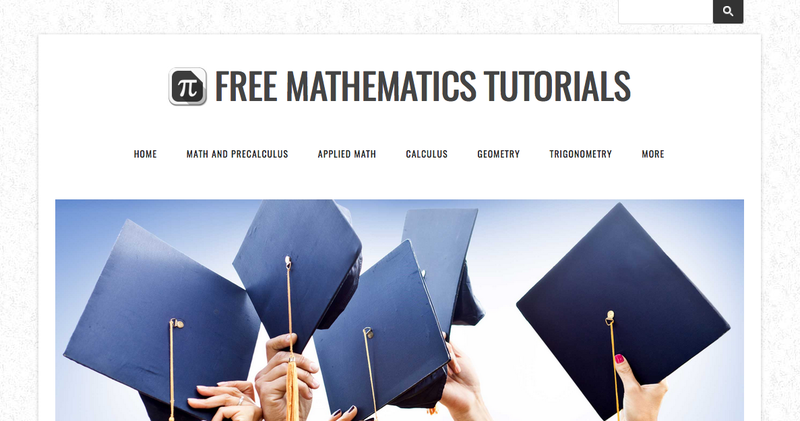 Make sure to check out our top 10 free math websites! Are there any other math resources I missed? Comment below and let me know! Happy Learning! Thanks for catching the mistake!